Any other comments? - Great location convenient to stairs and elevators. "C:\Users\825-855\Pictures\Serenade of the Seas Cruise March 2011\P3190020.JPG"
"C:\Users\825-855\Pictures\Serenade of the Seas Cruise March 2011\P3190015.JPG"
"C:\Users\825-855\Pictures\Serenade of the Seas Cruise March 2011\P3190016.JPG"
"C:\Users\825-855\Pictures\Serenade of the Seas Cruise March 2011\P3190017.JPG"
"C:\Users\825-855\Pictures\Serenade of the Seas Cruise March 2011\P3190018.JPG"
"C:\Users\825-855\Pictures\Serenade of the Seas Cruise March 2011\P3190019.JPG"
Balcony View - Hump balcony, double wide. No obstructions. Balcony Size? Normal or oversized for class? - Normal for class. Was wind a problem? - wind not a problem. Any other comments? - Pics in signature link. 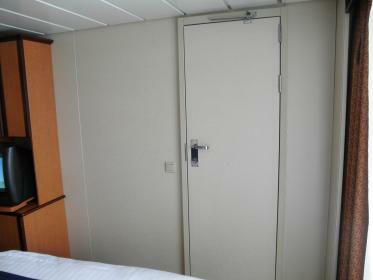 Quiet Stateroom? 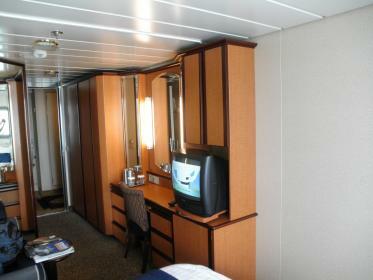 (With comments on problems) – Yes, no noise from hallway or adjacent staterooms. Cover over lifeboats below seemed to muffle pier noise when in port. Balcony View - Give comments on view, noting if location of any obstructions was an issue. – Cover over lifeboats below blocked view directly down to water but view outward was fine. If wanting a balcony but afraid of heights this is the ticket. Balcony Size? Normal or oversized for class? 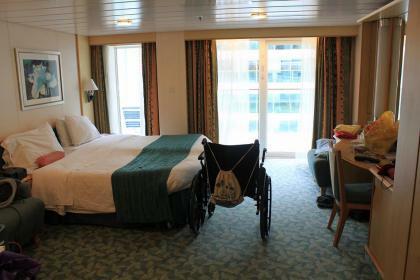 - Note: This is a handicap accessible cabin so the balcony is wider than normal with a ramp to allow wheelchair access. Such cabins should always be booked according to need not space. Any specific problems with this cabin? - None. Cabins on both sides reported sewer smell from shower but we did not notice. Any other comments? 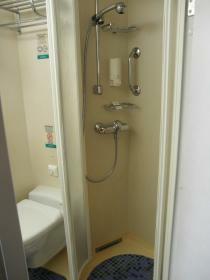 - Handicap accessible features we found useful were the door opener, wide door to allow wheelchair to roll in, flip down seat in shower, hand held shower head, ramp to bathroom and balcony and phone in bathroom. Note though that the ramps extend into the room space a bit and can be a tripping issue when walking. To our delight the toilet is not a super high wheelchair type common for handicap toilets. Cabin is about 50% larger than typical for category allowing room enough to turn in wheelchair. Balcony View - Give comments on view, noting if location of any obstructions was an issue. – Central Park.. beautiful..could open the balcony at night and hear the music. I will be in Radiance 9256 in November, December 2011 so will post after our trip to Australia and New Zealand. Everything I have read about this cabin is excellent, hope I feel the same when I return. Quiet Stateroom? 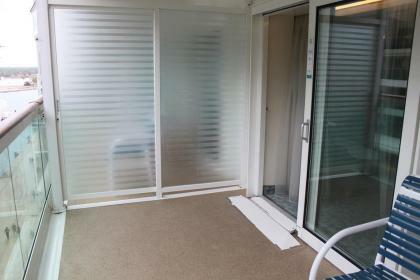 (With comments on problems) –This is a Boardwalk Balcony, we had no problems with noise from the hall or from the Boardwalk. Balcony View - Give comments on view, noting if location of any obstructions was an issue. – Spectacular. We could see the Aquatheatre, the wake, and all of the activities on the Boardwalk. We were right above Johnny Rockets. Balcony Size? Normal or oversized for class? - Normal, nice for eating breakfast. Any specific problems with this cabin? No, it was wonderful! Any other comments? The bed was by the closet, and the sofa and vanity were by the balcony. The mirror over the vanity reflected a lot of light and made the cabin feel bigger. We liked the location so much, we have booked the one next door (12715) on the Allure. Quiet Stateroom? (With comments on problems) – Very quiet! No noise issue at all. Would book it again. Any specific problems with this cabin? - No problems at all.May be an issue to those who have motion sickness (as the waves seem really close to the window). Stateroom Category – D1 "Hump"
Quiet Stateroom? (With comments on problems) – sUPER LOCATION!!! Very quiet, considering we were right off the centrium. You could hear [ muffled] piano music early in the evening but after 10 they don't play live music and it was very quiet. Balcony View - Give comments on view, noting if location of any obstructions was an issue. – Unobstructed view, fabulous 'hump' balcony. Balcony Size? Normal or oversized for class? 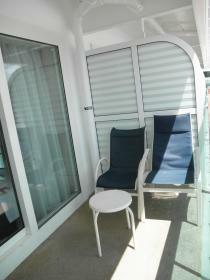 - balcony was slightly larger as the room was on the 'aft' end of the hump. Was wind a problem? - not too bad, the usual when ship was underway. If an aft cabin, was soot a problem? - no soot but cigarette smoke from forward cabins was an issue at times. Any other comments? - vERY CONVIENIENT TO ELEVATORS AND JUST A FEW FLOORS UP TO THE ACTION, OR FEW FLOORS DOWN TO THE THEATER AND MDR. View - Large window looking out at the sea. Often docked to starboard. Any other comments? - Room had sofabed. It was a quiet room, no vibration, and noticed very little motion. Very convenient to foreward venues i.e. Spa, Theatre, Solarium, Sorrento's, Schooner Lounge. Would not hesitate to book this room again. Any other comments? - We would definately stay in this cabin again. Balcony View - Give comments on view, noting if location of any obstructions was an issue. – Great view, no obstructions. Cabin location is midship. Any specific problems with this cabin? - Absolutely no problems w/ this cabin. Any other comments? - Great cabin steward named Leonardo! Thanks to all who posted pictures with your post. Any specific problems with this cabin? - On most ships this is a great location, but on the Jewel it was NOT Good. They have a lot of the noisy activities (loud music and talking) in the Centum which is right outside the door. Very annoying if you retire early or like to nap during the day. Loud music until 1:00/2:00 most nights and very late on last night. Any other comments? - I will not book a hump room on a Radiance class ship again. Balcony View - Give comments on view, noting if location of any obstructions was an issue.Wonderful! It is very long and on the hump. Balcony Size? Normal or oversized for class? - Very long, same depth as others on deck 10. Hot tub on balcony(did not use). Balcony size=217 sq ft.
Was wind a problem? -No more than any other balcony. Any specific problems with this cabin? -Believe it or not, access to the walk in closet is awkward. But with all the space, a couple could live in this suite for a month without a problem. Suite size is 1087 sq ft. Bed is round!--kind of strange, but has mirrored ceiling. 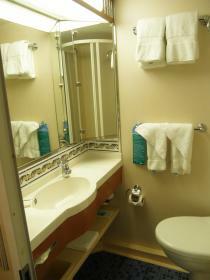 Bathroom is massive, shower "stall" could hold six persons (if you were so inclined). Wet bar, full size dining table, and a service kitchen where we stored our luggage(won't fit under round bed). This would be an excellent suite for a private party. Could sleep additional persons in living room, but no privacy for them. Sorry, having trouble uploading pix, if I get it figured out, will do so later. Quiet Stateroom? (With comments on problems) – No, the Fiestas at Rita's Cantina right across from us made the nights very noisy. Balcony View - Give comments on view, noting if location of any obstructions was an issue. – No obstructions, great view of Aquatheatre, Boardwalk activities and wake. Any specific problems with this cabin? 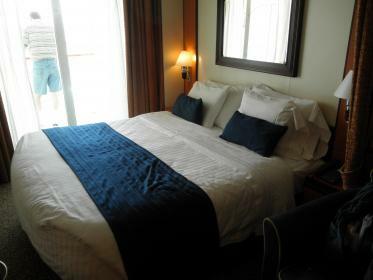 - Bed is by the window, we had bed by the closet on Oasis and liked that better since it made the cabin feel more roomy when the sofa area connected to the balcony area and the light from outside was reflected in the vanity mirror. Biggest problem was noise from Rita's Cantina in the evening. Any other comments? 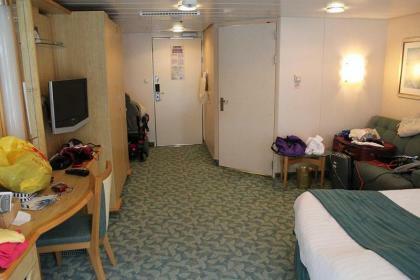 - Although we loved our B2 on oasis (12717), we were disappointed in 12715 on the Allure due to the noise problems. Any other comments? - Bed close to balcony, loved it! The cabin felt more spacious thanks to that. Cabin close to elevators - very convenient Would have it again! Quiet Stateroom? (With comments on problems) – Quiet, though lots of hallway traffic. Balcony View - Give comments on view, noting if location of any obstructions was an issue. - Excellent sea view, no obstructions. Balcony Size? Normal or oversized for class? - Normal, I think. Wheelchair access for balcony (ramp) worked well. Was wind a problem? - Not for us. Any specific problems with this cabin? - None that I can think of. 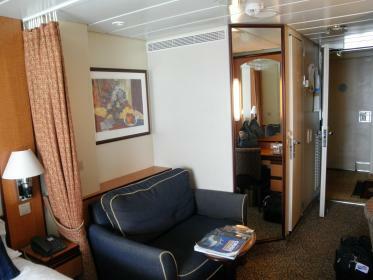 In fact, I liked it so well, I booked the same cabin for our next cruise. Any other comments? - The bathroom is compact, but there was plenty of room to maneuver my wheelchair. The sink is a little high, but workable. This is a great idea!! We will be going on Oasis,,Jan.2013,,we have a D5balcony and DD and family, across the hall from us ina OV of central Park,,,any comments on these rooms.. This will be our first cruise on the "big" ones,,,mostly cruise the Freedom Class,,,any help and or photos willbe appreciated:D:D:D..